The Baptist Messenger recently interviewed Russell Moore, popular author and dean of the School of Theology at the Southern Seminary when he was in Oklahoma to speak at the annual Pastors’ Conference. 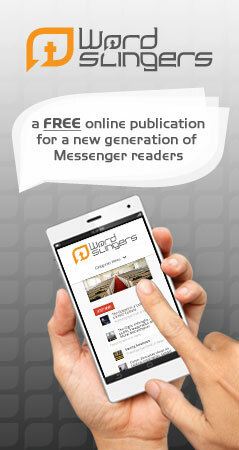 Baptist Messenger: Greetings. You brought an excellent sermon this morning at the pastors’ conference. What message did you want Oklahoma’s pastors to hear from you today? Russell Moore: I’m afraid most people in our churches think of Heaven as boring. They won’t admit it, but I think most people think, really, what’s waiting for them is just a reflecting back on life—gathering together, reuniting with family and friends—that it’s really an afterlife rather than an eternal life. I think what that tends to do is make us want to cling to all the experiences and all the recognition we can have right now, and it ultimately leads to disappointment and a sense of meaninglessness, so I think we need to recover what Jesus talked about when he said the Kingdom of God is an adventure, it’s a mission. There’s something waiting for you, and right now, you’re training for that mission. So your life isn’t behind you, even if you’re on your deathbed. Your life is in front of you. Messenger: That’s so well said, and Oklahoma commends you on your family and your compassion. With November just past and a landslide election, a key election, just having happened and maybe it didn’t go the way some people expected, could you talk about, culturally, some critical issues you see and how Christians should interact for that in our day? Moore: I think the key thing is that Christians need to respond to every tumult in the political world, no matter what it is, with kindness and with honor. Having conviction doesn’t mean you sacrifice kindness. As a matter of fact, Paul says to Timothy that kindness itself is an act of spiritual warfare. In kindness, you’re speaking to some of those who are taken captive by the devil. Of course, not everyone who disagrees with us is taken captive by the devil, but all of us were formerly taken captive by the god of this age, Scripture says, and we all had our minds changed by the Gospel, and we’re all continually having our minds changed as we’re being conformed to the image of Christ. So we shouldn’t have an angry spirit, and we shouldn’t have a desperate, hand-wringing spirit. That’s what losers in the arc of history do. We’re not losers, we’re winners, and the Gospel says ultimately we’re kings and queens of the universe. So that means we don’t fret when we see certain things happen. The Bible says there are going to be challenges and struggles all the time and in every age of the church, so we need to be an optimistic and hopeful people who are speaking with conviction and being on mission with a sense of tenderness, kindness and Christ-likeness. I don’t think we should be the sort of people who are panicked. We ought to be the sort of people who are burdened and who are praying. All sorts of issues confront us in our country and in our churches, but I think the issues that are probably the most pressing and the most dangerous are the issues we don’t see. So these are the ways we have been conformed into the surrounding culture without ever recognizing that we have been conformed to that surrounding culture. So sometimes I think what we want to do is see those things that we obviously recognize as unjust and evil, and we ought to do that. But at the same time we need to be asking, how have we become the people Jesus warned us about? So, how have we become people who love Mammon for instance and worship our own security? Or people who have turned a blind eye to the sorts of things that happen among us? A divorce culture, for instance, that has wrecked the lives of children, families, our women and rips apart the image of Christ and his church in marriage. Those sorts of things have to constantly be evaluated as we’re conforming our minds to the image of Christ.